(Nanowerk News) Researchers at Emory University and the Georgia Institute of Technology have developed microscopic polymer beads that can deliver an antioxidant enzyme made naturally by the body into the heart ("Sustained release of a p38 inhibitor from non-inflammatory microspheres inhibits cardiac dysfunction"). 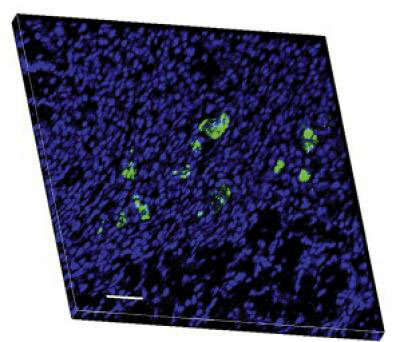 Injecting the enzyme-containing particles into rats' hearts after a simulated heart attack reduced the number of dying cells and resulted in improved heart function days later. Michael Davis, PhD, is presenting the results Sunday evening at the American Heart Association Scientific Sessions in Orlando. Davis is assistant professor in the Wallace H. Coulter Department of Biomedical Engineering at Georgia Tech and Emory University. The enzyme in the particles, called superoxide dismutase (SOD), soaks up toxic free radicals produced when cells are deprived of blood during a heart attack. Previously scientists have tried injecting SOD by itself into injured animals, but it doesn't seem to last long enough in the body to have any beneficial effects. "Our goal is to have a therapy to blunt the permanent damage of a heart attack and reduce the probability of heart failure later in life," Davis says. "This is a way to get extra amounts of a beneficial antioxidant protein to the cells that need it." The simulated heart attacks caused a 20 percent decrease in the ability of the rats' hearts to pump blood that was completely prevented by the particles, he says. The particles are made of a material called polyketals, developed by Niren Murthy, PhD, assistant professor of biomedical engineering at Georgia Tech and Emory. The polyketals encase the enzyme and are taken up by cells within the heart. There the particles slowly release the enzyme. The microparticles break down into nontoxic components in the body -- an advantage over other biodegradable polymers like PLGA (polylactic-co-glycolic acid), already approved for use in sutures and grafts. When polymers such as PLGA are made into particles for drug delivery, they can induce inflammation. Davis and his colleagues have also used the polyketal microparticles to encase anti-inflammatory drugs. This is the first report on the antioxidant enzyme-containing particles' use in a model of heart attack. Emory and Georgia Tech scientists have also used SOD-containing particles to treat mice engineered to have a deficiency in SOD in the lung: http://www.ncbi.nlm.nih.gov/pubmed/18787098. Although the SOD particles had a protective effect when the heart was examined three days after the simulated heart attack, the beneficial effects weren't as strong three weeks later. The rats' hearts still had a 35 percent improvement compared to untreated animals, Davis says. Combining them with microparticles containing the anti-inflammatory drugs proved to provide an additional boost. "This is likely because it is important to scavenge free radicals at early time points, but inflammation becomes more important later on," he says.